We almost take it for granted now, but it’s incredible that someone can now sit in a Starbucks, open an app and search for online real estate listings to their heart's content. They get to see a detailed description and photos of the home, schools ratings, a street and aerial view and lots of more details in the palm of their hand. As the much touted statistic goes, 90% of buyers now look for homes through the internet. The Sunday edition of your local newspaper doesn’t stand a chance anymore. How buyers find homes for sale has changed a lot over the years. Not so long ago, buyers were completely reliant on their agents to find out what homes were for sale. Now the masses are truly empowered and can be notified of a new listing just as quickly as their agent. The other day I was texting a listing to a buyer who at the same time he was sending me the very same listing. I beat him by a whole 5 seconds. Having all this unfettered access to information on homes is great for buyers and sellers. However, do you know based on what you see online whether a particular home is worth speed dialing your Realtor about or gulping down your coffee and dashing out to the door to do a drive-by? Obviously nothing beats going to see a home in person, but you can tell a lot from reading between the lines of online listings as to whether a home is a gem or an over-hyped dud. Conversely, some homes can be a lot better than the online listing portrays because the listing agent skimped on a professional photographer or advised the seller that staging was a waste of time. 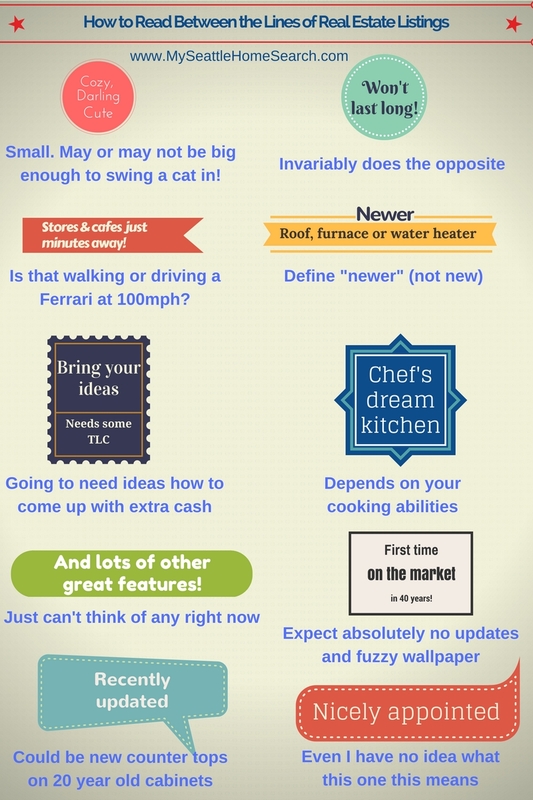 Tips for Interpreting online listing photos. A picture is worth a thousand words and for real estate listings, good photos can be worth thousands of dollars. 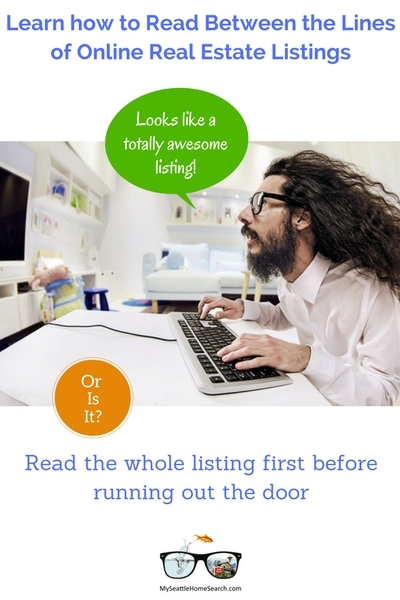 Most buyers will jump straight on the photos without reading the listing description. People love photos, it’s why Pinterest and Instagram are so popular. Plus pictures will usually tell you a lot more about the home than the fluffy agent-speak description. Photos can tell you a lot about the property both by expressly showing your something or alternatively, by not including photos for certain aspects of the home. The listing says there's a large basement, but there's no photos of the part of the home. Why? Once home buyers go from the casually browsing homes online stage to actively going out to visit homes, they often quickly learn that sometimes photos can be a little misleading when they compare what they see online with what the home is like in non-web reality. The number of photos: for the Seattle homes for sale, the local multiple listing service (NWMLS) allows agents to upload a maximum of 25 photos per listing and that’s more than enough for any property. Unless it’s Bill Gate’s home. You have number Bill! I mean how many different angles of that shiny new counter top and facet do you need? Leave something to the imagination! Just because an agent is allowed 25 photos, don’t expect 25 photos for every listing. For Bill and Melinda’s home, yes, but not for Bob’s one bed condo, no. Less photos that you would have expected based on the property description: The description and details said the home has 5 bedrooms and a huge lower level rec room but is only displaying 2 bedrooms and there’s no photos for the rec room. Either the listing agent is cheap and lazy or possibly doesn’t want you to see the rec room because it has some issues. In the case of homes with a lot of bedrooms, it is not always necessary to show all of them. Apart from the master bedroom, most bedrooms are not that interesting. The quality of the photos: just because the photos look professional doesn’t mean the home is automatically turnkey and fabulous just as much as bad listing photos don’t mean the home is not good and not worth seeing. It is not uncommon to see million dollar homes with spectacular views that have terrible photos taken by the Realtor to save a few bucks. It's a complete disservice to the sellers and I always wonder why sellers don't complain about bad service more often? Lots of outside photos before any interior photos displayed: Listings are required to display the exterior of the home as the first photo that displays on the online listing or the agent is allowed to use a view shot if the home has big panoramic views. A good sequence of listing photos, is to show two exterior photos and then draw the buyer into the interior of the home. If you open a listing and the first 8 photos are all of the outside, then that usually means that you are in for a less than spectacular interior and that the outside of the home is the best part of the property. Why is the main exterior photo of the home at such a weird angle or is taken at a vertical when all the other photos are horizontal? Well, that’s usually a case of the listing agent doing their best to hide some monstrosity that sits right next door or behind the home, such as a gas station, a 7-Eleven store or a giant new construction mega home that dwarfs the listing (good bye sunlight!). If you do see photos like this, jumping on Google Streetview or Google Earth (see below). The kitchen looks like a page ripped out of an IKEA catalog: Usually indicates the home has just been flipped by an investor. Yes, buyers have spoken and allegedly ALL of them want the exact same thing…Corian counter tops, the same white kitchen tiles, the same cabinets, the same engineered wood floors etc. Who says flippers lack any imagination! If you have the option, or ask your Realtor, search for the listing for the home for when the developer bought it so you can see how the home looked before the developer worked their magic. Some remodels are excellent. Some started out with good intentions, over extend themselves and started cutting corners. And some started out with zero good intent, just the intent to make a quick killing in a hot market. The photos have orange dates in the bottom right hand corner: It’s usually a sign that it’s a bank-owned (REO) property. There’s only ONE measly photo: Either the listing agent ran out of film (what’s that then?) or (1) the home is a tear down and the “value is in the land" or (2) sometimes it might be a short sale. 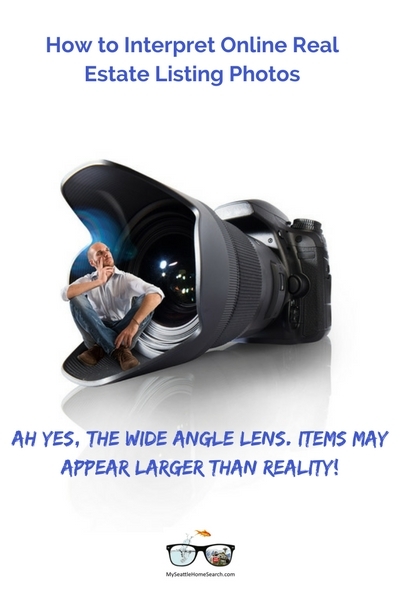 Short sale real estate agents are known far and wide for their photography skills. The photos show controlled chaos and zero staging: Can only be one thing…..unmotivated renters! The tenants know that once the home sells that will have to move so it’s in their interest not to make the home look too fabulous. The photo has Walter White in it: Meth lab! (OK, just checking that you were actually reading this). Do the photos match what the listing says? the description says “updated” kitchen but all you see is a new granite counter top sitting on 30 years old cabinets (aka lipstick on a pig) then you might want take the listing description with a wee pinch of salt. The listing has drone photos: got nothing to hide! (of the outside at least). Drone photography is becoming more common for real estate listings and works really well for certain homes such as large homes on big lots or homes sitting on the edge of a lake or ocean. Bob's one 1-bed condo is probably not a good fit for drone photos... unless there's a rooftop deck and it sits overlooking the Pacific. 3D Virtual Tour Walk Throughs is a cool new development that allows you to sit at home and do a virtual walk through of the home, swivel the camera around like using Google Streetview and navigate your way around the home. Will become more common with time but will require multiple listing services to allow links to those videos so that consumers can access them. Note that listing photos slideshows with some music overlaid are often called virtual tours but they are not. They’re slideshows. Marge: "Well, like we say: 'The right house for the right person.' "
Hutz: "Listen, it's time I let you in on a little secret, Marge. The right house is the house that's for sale. The right person is anyone." To drive home his point, Hutz shows her photos of houses for sale. Marge: "It's awfully small. ... "
Hutz: "I'd say it's awfully — cozy!" Marge: "That's dilapidated... . "
Marge: "That house is on fire!" For online real estate listings, the listing description is where the listing agent is provided space to try and describe why the home is so great and why you should come and see it, or even better, buy it! There’s no better place in advertising to find the maximum number of clichés crammed into a small space as you will find in listing descriptions. The photos will really sell the home but a great listing description that properly conveys the best aspects of the home definitely helps too. On printed out flyers that are attached to the for-sale sign outside the home the listing agent can wax lyrical all they like about the various aspects of the home. However, for online listing the agent will be limited to a certain word count. For most homes there’s usually a lot more that can be said about than is allowed with in the limited space. Hence the used of tried and trusted descriptive clichés to get the point across. If you are new to the online home shopping game you might be wondering what exactly do some of those phrases mean. Once you actually start going to see some homes and compare reality to online fluffy verbiage, you will wise up pretty quickly as to what each term means. Mapping tools will help reveal all about the neighbors and the neighborhood. Listing photos will show you the home, or at least most of it, but map tools will show you the neighbors, the neighborhood and beyond. The great thing about online listings is that they will have access to Google mapping tools which will help you check out the general neighborhoods and surrounding homes and properties. Google StreetView. When you click on that option it will park you on the street right in front of the home. Now you can swivel a full 180 degrees and see what the neighbors across the road looks like. Next use the arrows to move up and down the street without leaving the comfort of your Lazy Boy chair. The home for sale might look great but the neighboring homes might not be quite as inviting. Google Earth is like having your own drone. This is a great tool for getting an aerial view of the property and particularly good at giving you an idea of how big the lawn is when there's lots of trees around the home (perfect for NW homes). Also, it will help you determine if the neighbors have 5 dead cars on their back lawn they fully intend to use any day now. Basic Google road map is handy for viewing where the nearest parks are located, how close the home is to that busy freeway (possible road noise?) and is that a shooting range I see? Walk Score tool is really handy app for urban dwellers and those looking for homes with high walkability. Many buyers want to be able to leave the car at home and be able to walk to an emergency double deaf espresso or a pint of Mighty Whale microbrewery’s finest extra hoppy IPA. Walk Score will display all the local business on a map relative to the home and how long it takes to WALK to them (not drive). The higher the score, the greater the walkability. Listings with high Walk Scores will usually tout their score. Also, you will now know if the listing description states “XYZ is just minutes away” whether it really is walking minutes or car minutes. In summary, don't believe everything you read or see without reading the online listing in full and use all those tools that are available to you. Moreover, appreciate that you live in the digital era with everything at your fingertips. You are a lot more empowered than your parents were when they bought their home. Home buying: Tips for Spotting the Upgrades from Debbie Drummond.